Evening slowly advanced as the sky returned to a uniform overcast grey and, for a while, the Drake seemed to calm down - a brief calm, the proverbial one before the storm. 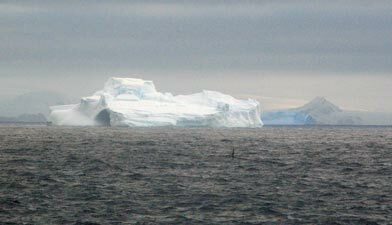 It was a chance to wander out on deck and admire the sheer size and colour of the giant tabular icebergs, now becoming rarer and rarer, or the elegance of our fellow wayfarers, the albatrosses and petrels of the great Southern Ocean, as they soared above the ocean swells. 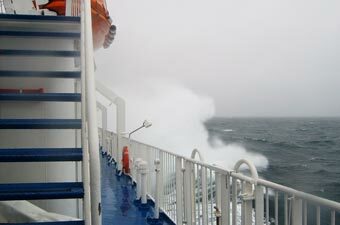 These swells gradually increased and the Ocean Nova soon developed a good roll and pitch as we headed northward into the night; the discrete appearance of sickbags on the stair rails and along the ship's corridors informed us that the dreaded crossing of the Drake Passage was underway. 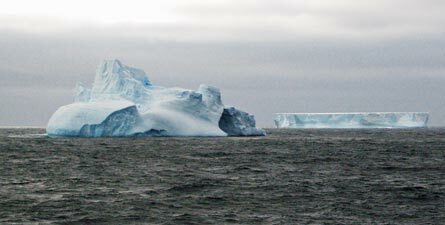 However, once we had crossed the Antarctic Convergence, the weather and wave patterns changed. 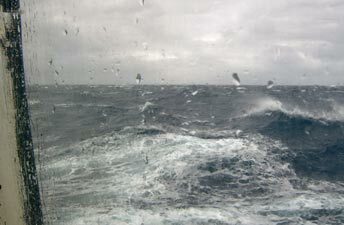 The wind picked up and the Ocean Nova drove almost directly into the big northwesterly swell; a little less roll and a lot more pitch with the odd large thump as it crashed down into the oncoming walls of water. 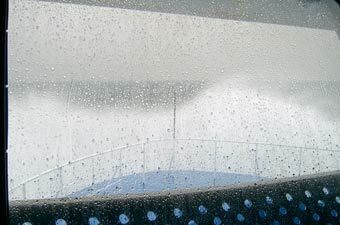 Waves breaking over the bow sent salty showers across the decks, some even dowsing the fifth deck panorama lounge windows; it was a good day to be inside listening to one of the lectures provided by the Antarctic experts on board. The Drake had saved its best (or worst) for the night. The ship was now angling across the big swells and it was difficult to sleep with the uneven yaw (corkscrew motion when a boat is pitching and rolling at the same time) of the ship. There were distinctly more empty spaces at the breakfast tables as the effects of this kicked in. 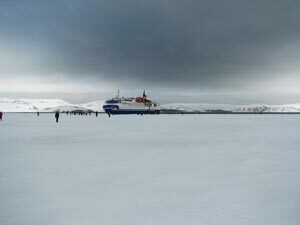 Though we only had 8 hours to go before the relative calm of the Beagle Channel it was going to be a long day. 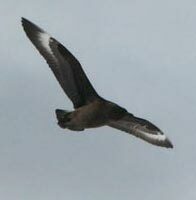 Even the number of seabirds following the ship seemed to have fallen overnight. 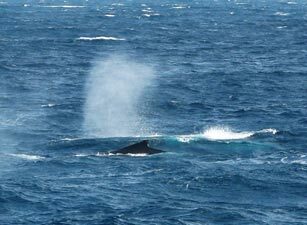 By the time that we spotted the faint outline of the outer islands of Patagonia, the wind had strengthened - 45 knots from the west - forcing the boat to plow through the swells with a permanent 15° list to starboard. 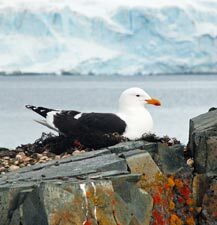 The Drake was beginning to flex its muscles, but an hour later the M/V Ocean Nova slipped into the shelter of the islands guarding the Beagle Channel. 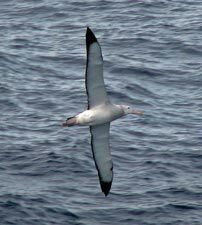 Our captain had just managed to avoid the worst of a Drake Passage gale. 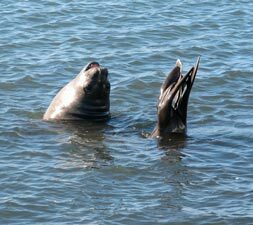 In the lee of Isla Nueva we anchored for a tranquil dinner and recap of the last ten days on the last continent. It was one last chance to share recollections with new friends before we all headed off to different adventures in different directions. 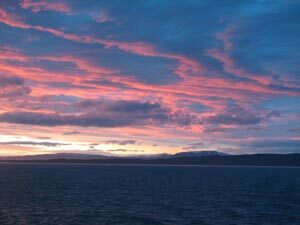 It was still a few hours to go before reaching Ushuaia and our last night was spent steaming sedately up the relatively calm waters of the beagle Channel to port. We woke to the sight of the pier outside our cabin window and the mountains of Ushuaia behind; time for a quick breakfast on board, then grab the backpacks and head ashore. The Antarctic adventure had been a highlight of our trip but there are still a few more things to be done in South America before we finally head home. 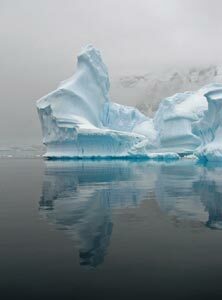 Our trip to Antarctica was a case of seizing the opportunity. 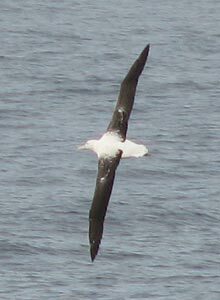 The southern tip of South America is the closest you can get on an inhabited continent to this remarkable landmass at the southern end of the planet. We had always planned to travel there much later, but when you find yourself on the dock of Ushuaia looking southward, carpe diem! Besides, with global warming and soaring fuel prices, would it be there then and would be be able to afford to go if it were? In recapitulation, it was a remarkable voyage. 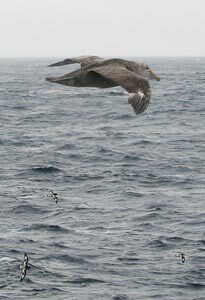 For two days we crossed the Drake Passage - a smooth Drake Passage belying its fierce reputation as one of the world's stormiest waterways. 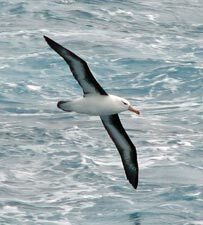 It was a chance to appreciate the immensity of the ocean, isolated from other humans but able to enjoy the company of the myriad of seabirds, albatrosses, petrels and prions of various sizes and types who shared the crossing with us, floating serenely on outstretched wings in the wake of the boat or swooping by as they used the ocean swells for lift and turn. 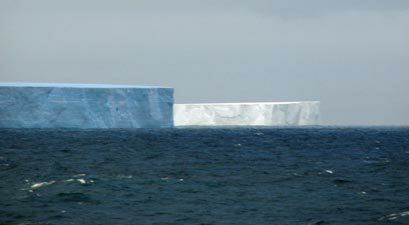 Our greatest excitement though was reserved for the spotting of the first icebergs, for they truly indicated that we were close to the great white continent. 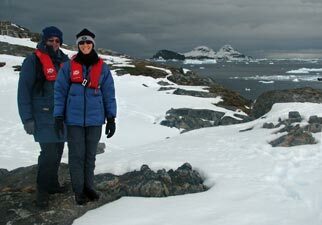 Our arrival in Antarctica was less auspicious, greeted on our first landing at Hut Island by strong winds and snow - perhaps the ideal start because it gave us no illusions as to what the Antarctic could deliver. 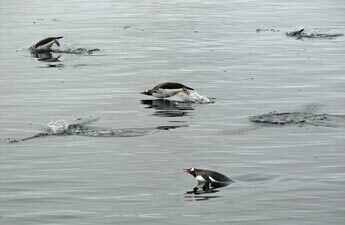 We also met our first penguins and seals, the first of many that we would see in the next few days. Later that day we set foot for the first time on continental Antarctica and we can't deny there was a sense of satisfaction in standing on our seventh and last continent (there is a bit of the stamp collector in all of us). 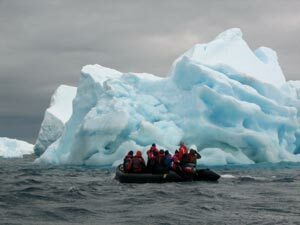 It was also a chance to view icebergs close up as we cruised amongst these amazing blue-tinted sculptures in our zodiacs; frozen water never looked so good. 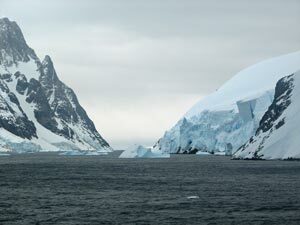 Passing through the Lemaire Channel gave us a chance to appreciate the ruggedness of the mountains of the Antarctic Peninsula; dark sheer rock faces separated or capped by deep glaciers flowing down to the sea from invisible icefields. Beyond that we were able to visit some Antarctic Research stations, both old historical sites and new ones, currently monitoring developments in the ozone hole amongst other things. Thanks are due to the Ukrainains and (later) the Argentinos for their hospitality at these bases. 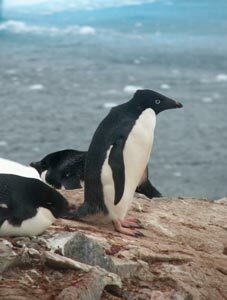 Today was an island hopping day, with more visits to the fascinating snowscapes of the offshore islands, and a chance to explore a little on foot, visiting more penguins rookeries and seal haulouts as well as spotting other Antarctic wildlife. 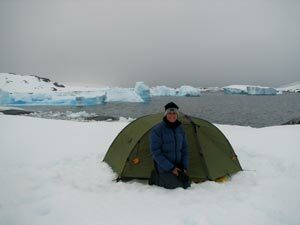 The highlight was probably the opportunity to spend a night (or Antarctic twilight) camping on Hovgaard Island, immersed in the solitude and silence of this white wilderness. Our third day in Antarctica saw us once again wandering amongst the penguin on a rarely visited cove where a French exploration team overwintered in 1904 (history is writ all around), but the highlight was undoubtedly a slow drift by zodiac amongst the giant icebergs that had gathered in the still waters of this mini-archipelago, their cold beauty magnified by the still and perfect reflections. The weather had been quite curious these last few days; at times clouds and mists rolled by to give the landscape an ethereal beauty, at other times the sky glowered dark grey above the pristine whiteness of snow and ice, menacing yet incredibly beautiful and curiously serene. On occasions, the sun would break through to bathe our snowy world in brilliant light or simply spotlight a cluster of icebergs drifting on a dark sea. We had one more visit to the mainland at Orne Harbour, climbing to a ridgeline for one last spectacular taste of the Antarctic landscape, before heading north again. Our adventure was not yet over and for two days we explored the marvels of the South Shetland Islands; sailing into the flooded caldera of a still active volcano at Deception Island to walk on the sea-ice, visiting tiny Half Moon Island and its penguin rookeries, sharing a yerba mate with the researchers at an Argentine Research Station and enjoying the slow-motion antics of the sea-elephants there and on Barrientos Island. 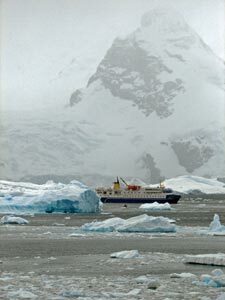 Barrientos was our last time ashore and the weather was glorious, the snow and sharp basalt spires of the island lay in sharp relief under a warm Antarctic sun. 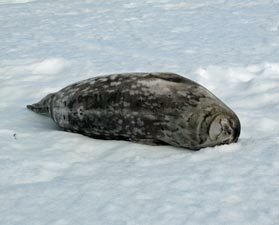 We did one last walk across the snowy landscape of the island, one last chance to admire the penguins, seals and nesting seabirds and then it was north again and homeward bound. 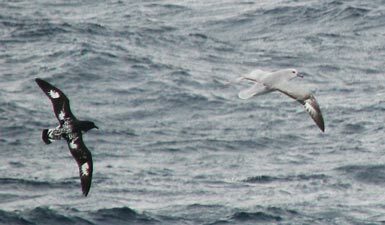 The adventure was not yet over, for the Drake Passage, so calm on our first crossing, showed us what it could do when the westerlies roared. 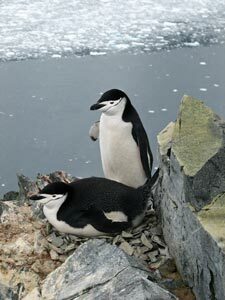 We felt satisfied to have had that experience - it really is part of the Antarctic adventure! And so ended our trip to the last continent. 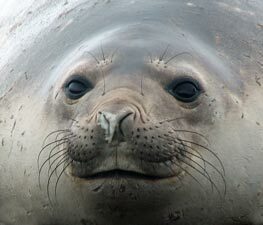 It was everything that we had hoped for - amazing landscapes, an incredible sense of isolation and silence, an appreciation of the immense forces of climate at play, tinged with the sad realisation that humankind is capable of changing these to such an extent (every indication was that the Antarctic Peninsula will be a very different place in fifty years time, and probably less). 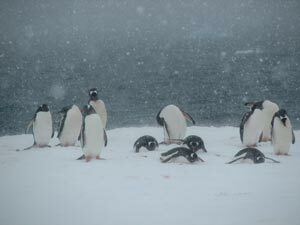 We had visited the white continent early in the season, at the beginning of the austral summer. 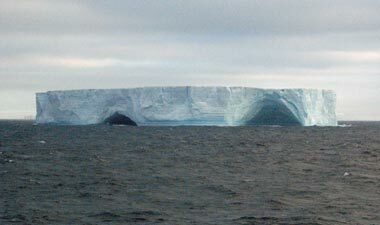 For us, that was good choice, because the peninsula and islands were still cloaked in a mantle of snow and icebergs and sea-ice was thick in the coves and protected waters. 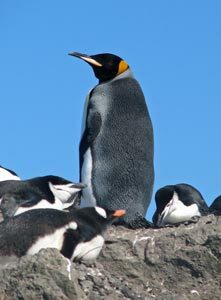 That said, the wildlife probably make the trip; the seabirds that follow the ship from South America to Antarctica and back, the seals and sea-elephants, occasional whales and, above all, the iconic penguins, waiting for us at every landing. We also had a very good boat and crew; knowledgable and informative experts and guides, roomy and comfortable cabins, great food and heaps of it. The "Ocean Nova" was small enough to get to know and make friends with our fellow passengers, small enough to get in close to shore and maximise the number of landings or zodiac trips, which are the reason for making this trip. 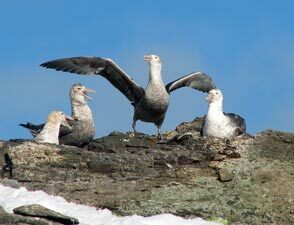 It was a good mixture of sight-seeing, wildlife encounters, and walks in different localities. 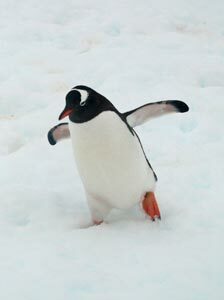 Now, when people talk about Antarctica, the images are very real and clear in our heads and sometimes they will just appear in our minds out of blue, to bring back a pleasant memory and raise a smile. Isn't that is what travelling is really all about.